It’s hard to rank the absolute best contract in the league given the varied contributions that hockey players provide, but near the top of any list would have to be Eric Staal. The former Carolina Hurricanes captain found himself struggling to record much offense during the 2015-16 season and was eventually traded to the New York Rangers. The move did nothing to help Staal’s play and when he became an unrestricted free agent in the summer there wasn’t a big money, long-term deal waiting. A 31-year old center who had registered 781 points in 929 games, won a Stanley Cup and was a two-time 40-goal scorer was forced to take a three-year, $10.5MM deal from the Minnesota Wild in order to refresh his career, and it was the best thing that could have ever happened to him. Staal took off almost immediately in Minnesota, scoring 13 points in his first 14 games while being given more and more ice time. Head coach Bruce Boudreau realized what he had, and Staal would end up registering 65 points for the Wild in the 2016-17 season. Already the contract was a bargain, but there was even more to come. Staal scored 42 goals this season, trailing only Alex Ovechkin, Patrik Laine and William Karlsson for the league lead. His 76 points were the most he’d had in a single season since 2010-11, and with just a $3.5MM cap hit he likely will go down as the best contract given out during the 2016 offseason—a summer that was marked with terrible deals like the ones given to Milan Lucic, Loui Eriksson and Troy Brouwer. Now, the Wild have to start considering whether to extend Staal into the future. He’ll turn 34 just a few weeks into the 2018-19 season, and could at any point take a sharp downward turn in production. He’s had struggles before, and age is bound to catch up with him one day. In Michael Russo of The Athletic’s recent mailbag (subscription required), he writes that new Minnesota GM Paul Fenton will wait until the year begins to start any extension talks, wanting to see his production first hand. Russo also suggests that Staal could be a trade deadline piece if the Wild take a step backwards this year. If they do falter and Staal is available, there are plenty of teams who would be willing to pay up to bring him aboard this time around. 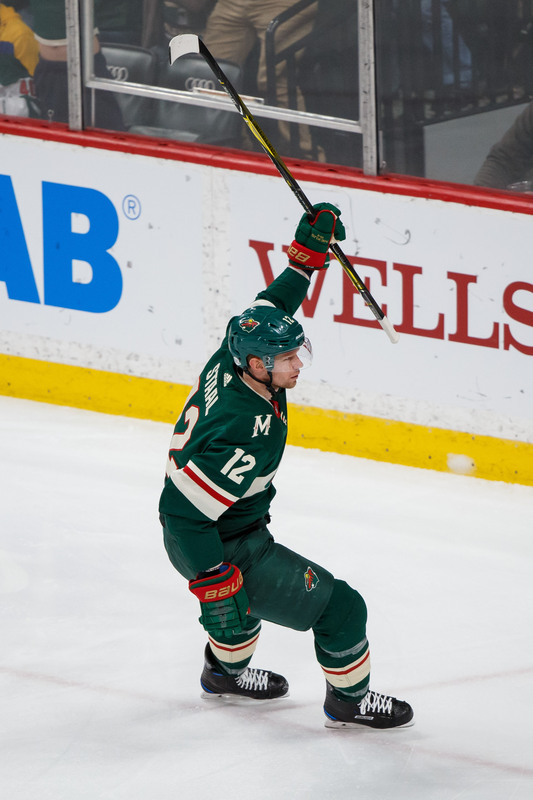 As long as he’s not mired in a huge slump, or obviously feeling the effects of age, he could likely bring back a substantial package for the Wild. In 2016 when the Rangers acquired him, it cost them two second-round picks and prospect Aleksi Saarela. That was during Staal’s worst offensive season of his career, and during a stretch where he had scored just one goal and five points in his last 19 games. Russo also broaches the subject of a possible extension though, suggesting—though qualifying it as a “total shot in the dark”—that it could come in around $5MM per season. That would make sense for a player of his age, though it would obviously depend on how many seasons the Wild are willing to commit for. If Staal is still producing at a high level, perhaps he would be more comparable to the three-year $18.75MM contracts that both Patrick Marleau and Ilya Kovalchuk recently signed. Staal even plays a more premium position at center, and has easily out-produced Marleau for each of the last two seasons. Regardless, the Wild will have to wait and see where their team is after an offseason that hasn’t brought a lot of change. The team hopes young players like Joel Eriksson Ek and Jordan Greenway can make a big difference, but they’ll have to experience improved health from some of their other key players and another solid season in net from Devan Dubnyk. If there isn’t an improvement on the ice, perhaps we’ll be talking about Staal as a trade candidate in January, instead of someone who is there to help turn things around in Minnesota. Now this is going to be a very interesting story this year. Does the Wild give a Marleau type signing during the season, or a trade at the deadline and then sign back…giving a Marleau type signing? I’m not dropping $6M+ p/y deal on a 34 year old center who has shown the ability to dip just as much as perform, but I’m sure sure someone will.